Looking for more information? Give us a call at the number above or use the form below. We're just a few clicks away. 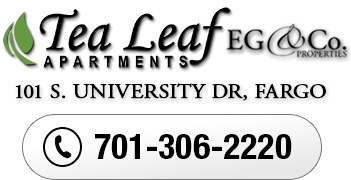 Tea Leaf Apartments provide affordable, apartment and living services for residents over 55 in Fargo, North Dakota. Our community is designed with personalized services, activities, and amenities for independent adults. We offer a variety of high-quality, apartment homes featuring modern appliances, paid utilities, with meal and other additional services available.